Today, we are looking at a gorgeous old Victorian-era mansion. This beautiful home is now part of the Heritage Square Museum. But this isn’t just any cool mansion, this gem is part of my personal history! The Heritage Square Museum is an absolutely wondrous location for anyone, especially architects, who enjoys being outside to stare at the buildings while they take in their history lesson. The eight structures of the museum, all built in the Victorian-era, were collectively saved from demolition and moved to the Heritage Square. They now serve to educate people about this fascinating era of our history in California and Los Angeles. 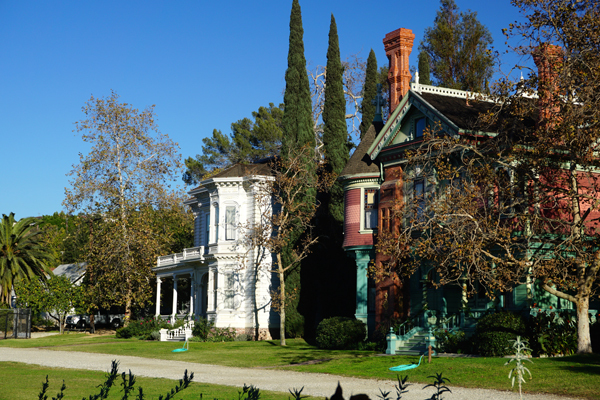 One of these historical buildings is the Perry-Hubbell House, also known as the William Hayes Perry Residence. This two-story mansion is the largest home at the Heritage Square Museum and was built in 1876 by businessman William Hayes Perry. Designed by architect E.F. Kysor, it is a fantastic example of classic Greek revival and Italianate style. Both inside and out, the house is simply stunning. Inside, you have fine hardwood floors, marble fireplaces, slanted bay windows, and a grand sweeping staircase. In its day, it was likely the most expensive and expansive house in all of Los Angeles. The house was moved from its original location of Boyle Heights to the Heritage Square Museum in 1975, where the Colonial Dames Society of America began to restore it to its original splendor. After the restoration was completed in 1995, the home was donated to the museum by the Colonial Dames. My connection to the house involves a little bit of family history. My great-grandparents, Sam and Anna Feldman, first arrived in Los Angeles in 1921 and needed a place to stay. At the time, the Perry-Hubbell House was owned by the Soloway family. Mrs. Bessie Soloway was related to my great-grandmother, so they were welcomed into the home. My grandfather, Robert Feldman, born in Chicago in 1910, spent some time living in this beautiful house while the family started to put down roots in L.A. Given this family history, I was understandably curious about the place. Twenty or so years ago, I actually snuck into the Perry-Hubbell House before the restoration was finished. Back then, you couldn’t tour it legitimately, so… I may have bent the rules a bit and given myself a tour. Today, you should have no problem booking a tour led by museum guides who will tell you all about the history of the house. In fact, I recently visited with my father and my son Graham. 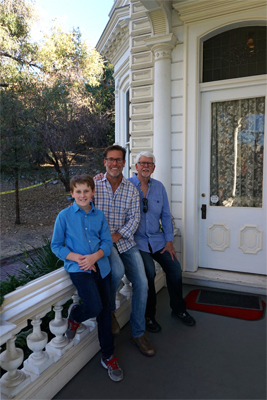 We now have a photo of us three hanging out on the veranda of Graham’s Great Great-Grandparents’ first home in LA! As you can probably tell, I absolutely love the house, both on a personal and professional level. If you ever get the chance, the Heritage Square Museum is well worth a visit. Not only will you see the Perry-Hubbell House, you will also get a chance to tour the eight other historical structures onsite. 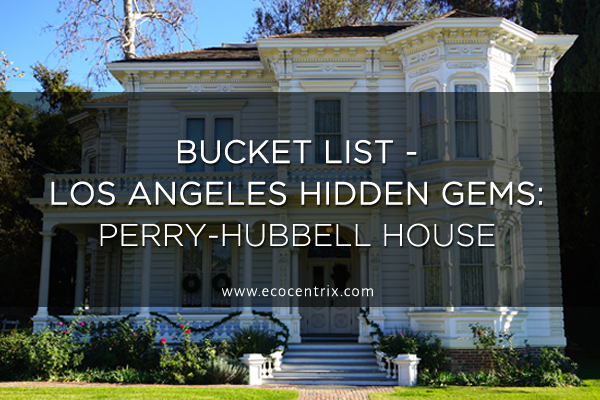 The museum, and especially the Perry-Hubbell House, are genuine Los Angeles architectural hidden gems!